One of our favorite add-on's from last year has to have been the Wii Balance Board with built in Digital Scale from snakebyte. It was the first third party balance board that we've seen and was a really innovative product that actually had a purpose when not playing games! Much like the board, snakebyte's newest- a Bluetooth remote for the Playstation 3 -has some extras built in as well. Notice that big screen at the top? Time and room temp. The remote also features IR compatibility, not just Bluetooth. So you'll be able to remotely control up to 6 other IR devices in addition to your PS3. 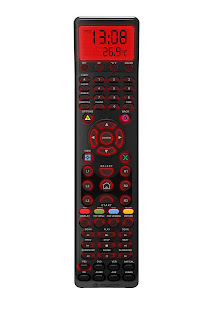 Sunflex USA, the exclusive U.S. distributor of the video gaming brand snakebyte™ and FINAL FANTASY® XIV controller, today unveiled the snakebyte™ Premium Bluetooth Remote at the 2011 International CES. Utilizing both Bluetooth and standard Infrared wireless technologies, the remote makes controlling your PS3™ and up to 5 other A/V devices simultaneously a simple task. Check out the snakebyte™ Premium Bluetooth Remote along with other gaming accessories for PS3™, Wii® and PC’s, on display at the company’s booth (#5808, North Hall) during the 2011 Consumer Electronics Show at the Las Vegas Convention Center, January 6-9, 2011. The snakebyte™ Premium Bluetooth Remote will retail for $49.99 and will be available April 2011 at www.snakebyte-usa.com and other e-tailers. If you’re interested in connecting with snakebyte™ on popular social networking sites, follow the company on Twitter and “like” them on Facebook.